Proxifier can resolve hostnames through a proxy server. This feature is useful when a DNS server is not available or restricted. Generally speaking, it is not recommended to use this feature in all other cases as it has some limitations versus the normal way of resolving. For example, it is impossible to get a real IP address through a proxy so Proxifier has to assign placeholder (fake) IP addresses like 127.8.*. * which are only valid within the local computer. Proxification rules based on IP addresses will also not work in this case. By default the Detect DNS settings automatically mode is enabled. In this case, Proxifier continuously tracks the network condition and if system DNS is unavailable Proxifier automatically enables the Resolve hostnames through proxy option. You can disable automatic mode and enable/disable this option manually. 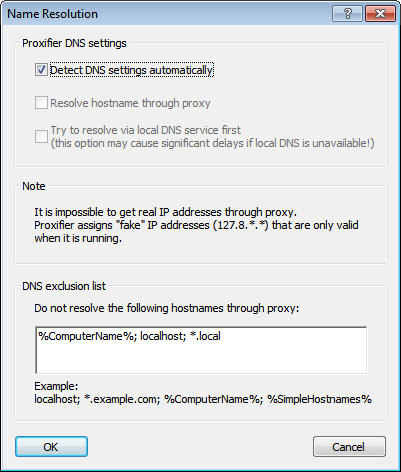 (Automatic DNS mode detection) Local DNS service is available/unavailable. Name Resolution through proxy is disabled/enabled. The current DNS mode is also indicated at the Status Bar of the main window. It is also possible to enable a combined approach with the Try to resolve via local DNS service first option. In this mode Proxifier will try to resolve the name with system facilities first. If this attempt fails the name is resolved through a proxy server. Use this approach very carefully as it can result in significant delays, for example, if a non-existent hostname is requested! DNS exclusion list contains the names that should not be resolved through proxy. If a hostname matches an entry of the list, the name is resolved by system facilities. You can use wildcards (masks) where “?” matches any symbol and “*” matches any substring. %SimpleHostnames% constant defines all names that do not contain a domain/subdomain (i.e. there are no dot-separated parts). Usually such hostnames are used with a local network so it makes no sense to resolve them through a proxy. Proxifier will output DNS requests if Verbose output mode is enabled (View->Output Level->Verbose), which can be useful when investigating DNS related problems. Name resolving settings are stored in Proxifier profiles. So you can save/load them like the other settings.